We’re all behavioral designers on a mission. To break people from their comfort zone. To propel new ideas forward. …And in doing so, we can change the world. Lofty goals on paper, sure, but this was the message that would resonate throughout PCMA’s Education Conference in New York City’s Marriott Marquis last week. And, as a mission, the conference was delightfully designed to live in to it. 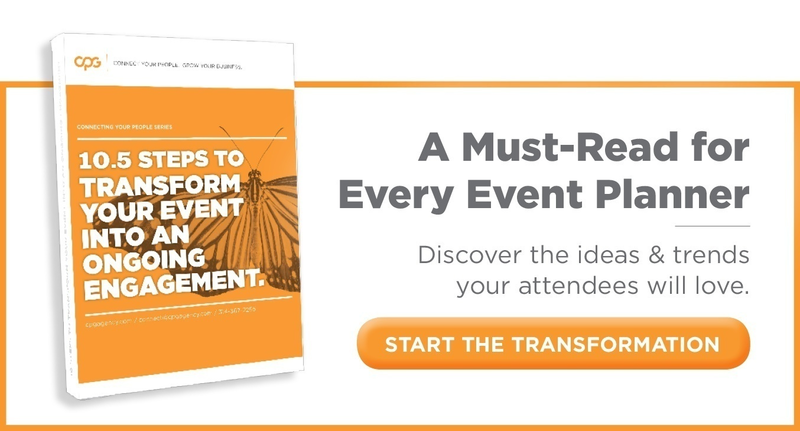 At CPG, we make it clear that attendees must be transformed into participants in order to make an impact. We partner with clients and prospects to create event engagement tactics that spur creative collisions and bring out big ideas. PCMA EduCon introduced speakers, sessions and networking events that actively broke us out of our comfort zone, connected hundreds of people from across the industry and challenged us to work together to solve problems. In other words: All the things that make an event successful. By leveraging outstanding sponsors, a brilliant location and an engaging presentation format, this conference was able to provoke different thinking and promote a community atmosphere. Matt Wallaert, a behavioral scientist and entrepreneur, explained that we’re all behavioral designers who are challenged with making our events easier for attendees. Whether it’s through networking, learning or even attending – what are we doing to make attendees feel special and unique? As event planners (and humans), we influence behaviors at our events. And while we tend to focus on the promotional pressures (telling people that something is important) – instead we need to hone in on the inhibiting pressures (giving people an easier way to do it). KEY TAKEAWAY: Know the behavior that you want to come out of a conference and design for it. Give people a reason to engage. When we make it easy for people to act, we pair delight with satisfaction – which creates happiness. At PCMA, avoid coffee at your own peril. The moment you hit the conference floor – you’re going to be interacting with peers – whether it’s finding a seat for breakfast or sharing a table for the welcome or workshopping at sessions – participation is happening and resistance is futile. Each session was set up classroom style or in crescent rounds so attendees can workshop together. Speakers provided handouts that helped with note taking and regularly asked for audience participation to keep an engaging pace throughout the session. KEY TAKEAWAY: This “forced interaction” was an excellent way to make new friends and implement key learnings instantly that help solidify the process. And that’s where great ideas are born. KEY TAKEAWAY: Be open to everything, everywhere. Be brave, curious and open to the powerful, personal experiences that hide behind every corner. Use inspiration and creativity to connect the dots for your next big idea. Arguably the most buzz by attendees was concerning the immersive learning experiences that were baked into the second day. And the intrigue was generated by not sharing with attendees where they would end up. Six groups were sent to six locations across Manhattan to match their registration’s content preferences to an offsite education experience. As groups were sent to Tavern on the Green in Central Park, the Microsoft Store, New Amsterdam Theatre, the Manhattan Center and Convene’s HQ, my group hopped on a bus bound for Jacob K. Javits Convention Center to dive into Show & Exhibit Design. Led by Grass Roots Meetings & Events Managing Director Howard Givner, Expotechnik Executive Vice President Thomas Frisby, and Lippman Connects Founder Sam Lippman, we challenged ideas around disruption, innovation, design thinking, show engagement and improving exhibitor and attendee ROI. KEY FORMAT TAKEAWAY: This is an excellent way to use your city (and the world around you) to elevate your attendee experience and bring your message to life. KEY SESSION TAKEAWAY: We need to be actively evolving our events from where there are now to where they need to be. What can we eliminate, raise, reduce and create to instigate this disruption? Think differently. Break rules when you need to. Challenge the way people are used to learning. Provide a journey of discovery for your attendees that engages at every turn. And finally, if you want to know the goals that your attendees are looking to achieve – ask them! This message encapsulated Jenny Stanfield’s session “Turbocharge Event Engagement with Storytelling.” Since 80% of the way we communicate is through narrative, use storytelling as a way to connect with and engage your audience. Since storytelling is all about context, where is your focus going to be? The destination, the giving back, the team bonding? How do you incorporate these story elements into your next event? Tyler Gates brings stories to life in his business. His session “Electrify Events with Augmented and Virtual Reality” demonstrated how you can communicate your story in entertaining, immersive ways. VR helps transport people from the trade show into a real life scenario and teach them how to act. It’s a creative way to get people to experience the utility of your product. Plus, you can measure it easily. KEY TAKEAWAY: Stories don’t just drive the message home – when done in an immersive setting, they help us remember the learning because it was an experience. Make Failure Your Fuel – Hone in on where you belong and crash more to build up your resilience. Play Your Specialist Game – Sharper focus gets better results so build a stronger foundation and be spectacular for few, not average for many. Change the Game – Don’t miss your opportunities for change and always play your own game. Bring Out the Extreme in Others – When you know your team intimately, you can partner with those least like you and narrow your focus while diversifying your team. KEY TAKEAWAY: Harness this systematic restlessness that keeps us moving forward event after a failure or blow to your momentum. Once you achieve mastery – it’s time to get uncomfortable again. To wrap up, I wanted to bring focus to a few other things that I think PCMA did right with the Education Conference. I’ll just list them at a high level in no particular order. From Rockefeller Center to the Central Park Zoo, NYC & Co proved to be a leader in event design and delighted everyone in attendance with immersive events that were on brand and unique to the city. Session workshops, give back tools, the “CONNECT” networking space, the offsite experiences, the meal seating, the app, the destination, the venue, etc. I was impressed at every turn. One size will never fit all, and PCMA worked diligently to provide content that fell into each of our wheelhouses. From learning more about attendees at registration to creating crowdsourced sessions on the fly from attendee feedback to designing a special contest where selected teams pitch a disruptive event idea, this conference was built to ensure value and ROI for every attendee – just like our events should be! From the playful “housekeeping” notes of Mary Pat Heftman, PCMA Chair and Executive VP, Convention & Strategic Alliances for National Restaurant Association to the leadership and bot-joy sharing skills of Deborah Sexton, President of the PCMA Education Foundation, PCMA makes you smile and want to be a part of the movement. Plus, can I mention that networking space again? The networking area on the fifth floor was designed to get attendees to “think big and bust out of your comfort zone.” With places to share ideas, learn more about giving back, influence content for future events, stir up some caffeine, play some ping pong or just learn where the best place to eat in NYC is, CONNECT was optimized for engagement. I had several great conversations with organizers and attendees thanks to the setup. And if you read this far, you were either there and eager to relive the moment or you’re looking to get involved in the movement next time. I highly recommend your participation. FINAL KEY TAKEAWAY: PCMA lives into the mission that is disrupting traditional events. It’s more than logistics; it’s about strategy. How are you breaking attendees out of their comfort zone and transforming them into participants? How are you recalibrating your approach to ensure each event produces a vibrant, high-sharing community? As CPG would say – How are you connecting your people and growing your business?